Your smile says a lot about you. Studies show that people with healthy looking smiles are perceived as younger and more confident. Do you have areas of your smile you don’t like? If your grin has imperfections, your trusted cosmetic dentist in Collierville is here to help! 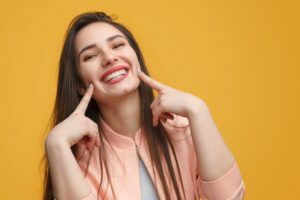 There are many different cosmetic dentistry services that can enhance and fix your smile, so how do you know which one is right for you? Take the quiz below to find out! Answer the questions below to find out which cosmetic dentistry treatment would benefit your smile the most. #1. How would you rate your smile’s appearance on a scale of 1-10? Between 7 and 9: It looks pretty good, but there are a few minor issues I wish weren’t there. Between 4 and 6: It looks average. There are imperfections to the point where I’m afraid to smile sometimes. 5 or below: I have flaws that are easily noticed like significant discoloration, chipped or broken teeth, and other issues that make me very self-conscious. #2. What’s your budget for treatment? Low cost is my top priority. I am willing to spend a little more to achieve my desired results. I am ready to spend as much money as needed for my smile. #3. Are you looking for a temporary fix or do you want to permanently alter your smile? I want to keep my natural teeth. I am willing to consider permanently altering my smile. I will do whatever it takes to give my teeth the help they need. #4. Do you have structural issues like decayed, broken, or missing teeth? My teeth are healthy besides a few small chips. My teeth have some chips and cracks but no decay. If you answered mostly 1, congratulations! You have minor imperfections that can be fixed easily with cosmetic bonding. During this simple procedure, your dentist will use composite resin to rebuild, mold, and shape the imperfections in your smile to make your grin look as good as new! You should also consider whitening treatment if discoloration is your main problem. Both of these procedures are fast and cost-effective. If you answered mostly 2, porcelain veneers or Lumineers are treatments that can drastically improve the look of your smile. While veneers need permanent alteration of the tooth enamel to be successful, Lumineers are reversible in most cases. They can cover up your tooth to make your smile white and bright for years. If you answered mostly 3, you probably have structural issues that affect the form and function of your teeth. You may need a smile makeover which combines multiple cosmetic options with restorative measures to bring back your smile’s health. The cost can vary based on which treatments your Collierville dentist recommends. Now that you know which cosmetic services you may need, talk to your local dentist today to get your smile back on track! Dr. Joshua A. Holcomb takes pride in treating each patient individually to make sure they are getting the care they need. He offers a wide variety of cosmetic dentistry services to help his patients smile with confidence! He currently runs his own practice, where he can be contacted through his website or by phone at (901) 850-0300 for any questions.